Iran has reportedly blocked virtual private networks (VPNs), used by millions of Iranians to access banned websites such as Facebook. “Only legal and registered VPNs can from now on be used,” Ramezanali Sobhani-Fard said on March 10, according to Iranian news media. He heads parliament’s information and communications technology committee, which will review the results of the block implemented on March 6. The VPN ban may be a precautionary measure ahead of presidential elections scheduled for June. After the disputed 2009 presidential election, Iranians used Facebook, Twitter and YouTube to organize demonstrations and document the government's crackdown. Those sites were subsequently filtered. But many continued to use them via VPNs. Now, banned sites may be more difficult to access. The announcement of the VPN block came just days before the European Union implemented new sanctions on March 12, targeting Iranian cyber police, judges and media officials. Abdolsamad Khoramabadi, the head of Iran’s commission on cyber crime, was sanctioned for alleged connections to the death of blogger Sattar Beheshti in November 2012. He was also responsible for “blocking of numerous opposition sites, electronic newspapers, blogs, sites of human rights NGOs and of Google and Gmail since September 2012,” according to the European Union. Iranians use VPNs to mask the locations of their computers. This allows them to bypass the government filter and access many opposition websites and Western social media networks that are blocked. Up to 30 percent of Iranians use VPNs, Kamal Hadianfar, then chief of Iran’s cyber police, told Mehr News in June 2012. Some 17 million Iranians had Facebook accounts by October 2011, the technology director of the Student Basij militia told Fars News. 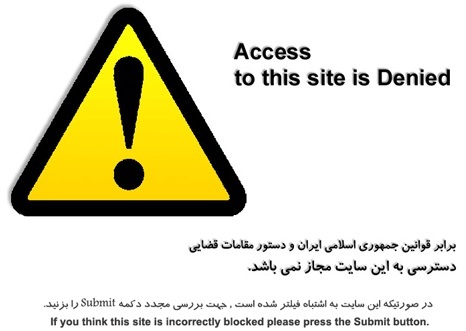 “Prominent Persian-language websites and other online services have been filtered one by one, and communications with external platforms is becoming progressively more difficult,” according to a new report by Small Media, a British organization researching access to information in Iran. The report notes that filtered sites range from music blogs to dating sites, and even a history site. In February, Small Media received reports from Iran saying that Viber and WhatsApp stopped working. Both are popular chat applications for smartphones. The regime also reportedly disabled text messaging services during the controversial 2009 election, according to a 2012 U.N report on human rights. Iranians will soon be able to purchase legal VPN connections, Secretary of the Supreme Cyberspace Council Medhi Akhavan Behabadi told Mehr News in January 2013. Supreme Leader Ayatollah Ali Khamenei announced the council’s creation in March 2012. Its mission is to “protect” Iranians from online dangers. Users may be reluctant to switch to the registered connections mentioned by the council secretary. Those VPNs could be more easily monitored by authorities. One organization has already provided a potential solution to the new block on VPNs. Project Ainita, which claims to fight online censorship in Iran, advised users to install a website encryption plugin and an anti-firewall service to bypass the filter. On March 11, the organization posted a detailed guide in Farsi explaining the installation process.